Poonam Kasturi calls herself Compost Wali. On a unique mission, she wants ordinary Indians to feel empowered, make a 'clean' difference to the society, by converting waste into useful compost in a simple and cost effective manner. Her organic business venture Daily Dump offers different types of composters that convert the waste generated in one's kitchen into compost. If the customers do not require the compost, it can be sold back to Daily Dump. What began as a small venture with family members and potters, three years ago, Daily dump saw its turnover rise to Rs 36,00,000 (Rs 3.6 million) in 2009. 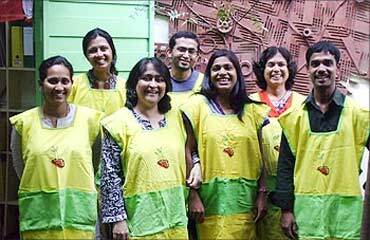 Today, the company has about 4,500 dedicated customers in Bangalore who use the profitable composters. The response has been encouraging and the company has steadily grown over the past 3 years. In the first year, Daily Dump made a turnover of Rs 200,000, which increased to 12,00,000 (Rs 1.2 million) in 2008. 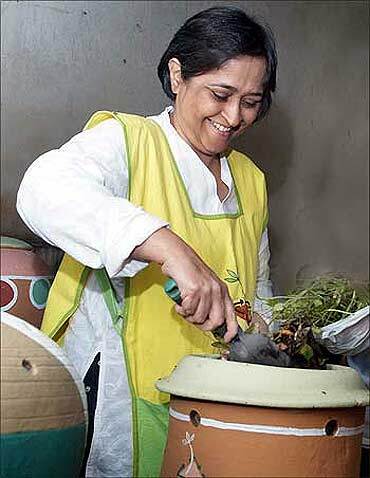 Poonam says home waste generated in one's kitchen is 50-70 per cent organic, but urban India has still not found an effective way to dispose this waste, which can actually be churned back into the system by converting it into useful organic manure. "Keeping this waste off the streets will be the biggest challenge that civic authorities across every city will face. If we can convert this into compost, it can reduce the mess on the streets by 60 per cent, that's a big impact," Poonam points out. The Daily Dump design is available to anyone who is interested, the designs are protected by a creative commons license and the cloning approach allows anyone to use these designs. "I plan to support every person who is brave enough to clone this in every possible manner," says Poonam. Poonam Kasturi shares her experiences of 'a great ride, tough but very fulfilling' of converting household waste into wealth and how her products can make a far reaching impact in a country like India. Image: Poonam Kasturi, founder, Daily Dump. You are working on a unique initiative. How has the experience been so far? I believe that distributed ownership without any legal payback obligations may spawn a richer way of looking at work in terms of knowledge dissemination. Creating a large centralised business was not the priority. Having set such a goal, I viewed traditional ideas of competition, market share, wealth etc through new lenses. So I started this project based on a number of ideas influenced by the systems theory, sustainable development, design methods, sacred geometries, craft development, Indira Darshinis (standup Indian fast food places), the open source movement, micro-enterprise, facilitative processes and design. And based on this approach, if composting becomes a national habit, without one large business house but lots of micro-enterprises, then the purpose of Daily Dump is well served. I also believe that if someone like Amitabh Bachchan and Rajni Kant endorse composting, it will have a huge impact, so I am looking for someone who will convince these people to do it. Most people find finance a major constraint to start a venture. How was it for you? I have funded the project with my personal savings. Image: The Daily Dump team. How many people are using Daily Dump composter? Besides, 4,500 customers in Bangalore, the composter has found its way across 700 homes in cities like Goa, Chennai, Delhi, Bombay, Hyderabad, Cochin, Pune, and Coimbatore. We also have clones in Chile (South America) and Jumeirah-Dubai (Middle East). Could you explain how people can go about doing this at home and where one can find these products? Daily Dump products are easy to use. Our range of products ensures that each customer can find a product best suited to her/his needs. The typical product for a family of 3-5 people to manage medium volumes of everyday kitchen/organic waste is the kambha. 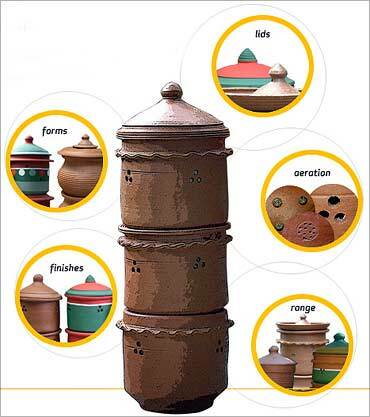 This is a modular/3-tier terracotta composter which works very simply. The top-most unit (A) is filled with kitchen waste till is 3/4th full (anywhere between 4-10 days) depending on diet and cooking. This is then swapped with the middle unit (B) till it is also 3/4th full. By this time contents of Unit A would have reduced in volume and this is transferred to Unit C and Unit A placed back on top for putting daily kitchen waste. Unit B shifts back to the middle and the cycle repeats. 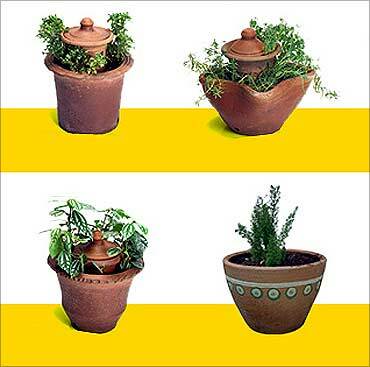 We advise customers to use the kambha in conjunction with a 'Leave-It Pot'. This acts as a store for semi-composted material to mature into compost; thereby releasing space in the kambha for everyday use. 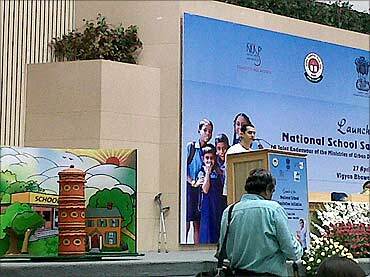 Image: Kambha at the launch of the National School Sanitation Initiative at Vigyan Bhavan. How's the feedback from people? What kind of problems did they face? We have realised that composting at home takes some time to get used to. Some of our customers may initially have fears related to the presence of maggots, ants, flies or smell. However, over a period of usage and gaining from the benefits of composting, these are issues that they overcome gradually. Daily Dump also ensures consistent and timely support to all our customers as we believe that home composting needs to be supported. Organic matter decreases considerably in volume on decomposition and the Daily Dump composters are designed such that the compost is formed and contained within the product till it is ready for use. The urban dilemma of increased apartment dwellers and restricted spaces has been a key factor in determining the design of our products. What is quantity of waste generated in Indian cities and how can solutions like Daily Dump's make a big difference? Bangalore alone is believed to generate 2000-3500 tons of waste per day. The government system is able to handle only 500 tons of this everyday. The rest ends up in landfills. 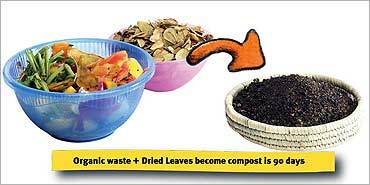 About 50-70 per cent of the waste generated in our homes is organic waste. As of Oct 2009, Daily Dump customers keep off 3500 kgs of organic waste from landfills everyday, so if each of us were to start composting, just think of the impact! How much compost can be generated from the household waste every month? A home of four typically in an Indian city produces organic waste of half kg to 1.5 kg a day. This works out to 30 kgs of waste a month. You can generate around 12 kgs of compost every two month. Image: Daily Dump products are easy to use. Do you buy back compost? How does this work? If you produce too much compost and don't know what to do with it, we can buy it back at our rates that we offer based on the quality of the compost. The condition is that you should have produced it in our composters and it should meet our quality checks. What are the challenges that you face? The design challenge is to enable homemakers to recycle their organic waste through a home composting product-service system. Other challenges include convincing all those who have never considered composting as an alternative waste management process and to be able to allay all their concerns. We try to make those who believe that this is the government's job to become self-driven composters, not motivated by any extrinsic reward/device. We strive to make composting a 'cool' activity, rather than a chore (that is cumbersome, time-consuming etc). It is tough to chnage mindsets, even of educated people, to get them to believe that when managed well, this is a hygienic process. It is a big challlnage to do all of this without being intimidating and over burdening with scientific facts and attracting readers to become users. How do you create more awareness about your products? How do you plan to popularise these useful products? How are the products priced? Have you thought about a tie-up with big retail stores to get better visibility? Our products are not expensive. Being small, I prefer the subversive, slow and bottom up strategy. I like to think, this way is more fun for all of us who are involved in it and fun for all the clones on the way and in the long run more sustainable and robust. However if large retail stores are interested in keeping our products then we would be more than happy. How much have you invested so far in the venture? My time is not accounted for but if you include that then it is in the tune of Rs 30 lakh (Rs 3 million). 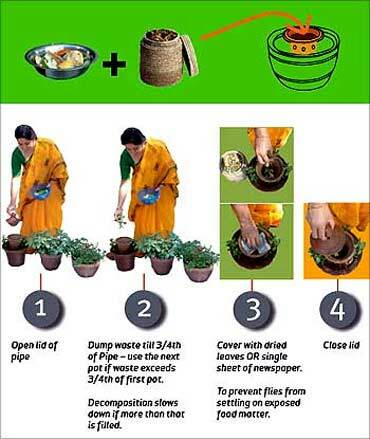 Image: The process of composting. Is this a profitable business? What kind of revenues do you expect? I did not start this as a business purely for profit. However, I also believe that to ensure its viability, we need to make some money to plough back into aspects of research and design. In the first year, we made a turnover of Rs 200,000, which increased to 12,00,000 (Rs 1.2 million) last year. This year, Daily Dump is set to treble its turnover to Rs 36,00,000 (Rs 3.6 million) . This we believe will help us invest in necessary research and design to take the work further. Could you tell us 5 things that entrepreneurs must do to succeed? Daily Dump is a truly collaborative endeavour and has been possible because of many people who gave their time and support wholeheartedly. Entrepreneurs must build a competency in one or more domains, real competency, that you can bank. Be willing to work on the shop floor. Don't take shoddy work lightly. Make peace with greed and power. Remember the earth that gives you your oxygen and food everyday. Money is just one of many other ingredients that is required to make life meaningful. Image: Waste turns into manure. What are your company's future plans? A mechanised composter for homes, which handles the task of having to turn the compost pile by the owner. There is big market for this type of product and we have to get the builders involved. Composting products for specific needs like big restaurants, cafes, marriage halls, convention centres and larger hotels. Bangalore has a lot of vegetable, fruit and flower co-operative outlets. These need specific low cost well designed solutions. Composting for large flats. Developers tend to highlight "gyms, clubhouses, pools" to attract customers. We hope that soon they can use "in-house composting units" to do the same. Products for other urban needs, like rain-water harvesting, organic farming, non-formal sector businesses. Communication material for children to understand issues of sustainability. I enjoy reading, love listening to Billy Joel and Joan Baez. I like watching movies. I meditate and like to lie under a tree and go to sleep. I worry about my son!